The abundant rainfall (6.5″ at our house in 5 days) has everything green and growing at twice the normal rate. My corn is 4′ high, no tassels yet. The tomato plants are waist-high and covered in blooms and small fruit. I started them from seed in April, so the early, prolific production surprised me. Okra is 3′ tall and there are lots of tiny pods. I have 3 or 4 deep purple eggplants about the size of an egg. Everything is happy and healthy. Yesterday, I picked 4 little crook neck squash. I had the squash for lunch, sauteed with green olive oil and Vidalia onions with a side of quinoa. Excellent. I have had to cut the squash plants back, thanks to a case of powdery mildew. (Us humans are going to mildew soon if the rain doesn’t let up!) I picked the first heirloom Fin de Bagnol beans, too. These crisp, petite beans are super flavorful. I picked enough for about 3 servings and there are plenty of tiny beans. Tiny beans are cute and fuzzy. I planted an heirloom beet, not much action there. The carrots I put in are called Paris Market, they seem a bit sparse. I am not sure what the massive rainfall does to root vegetables? Hate to admit it, but I just found the seed packets for 3 pumpkin varieties, cucumbers, and sunflowers that I had misplaced. Guess I’ll plant them and see what I get between now and first frost. Pumpkins ought to have a chance. The tomato horn worms came with my first vegetable harvest. 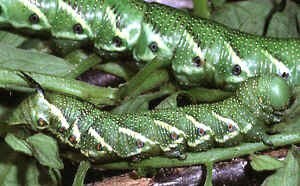 They are handsome as caterpillars go, plump and firm, green with white slashes and purple dots. They do make a quick meal out of tomato plants, though. I found three. One for each hen. I pulled them from the vines, they hang on tight! The girly-birds actually fought over these fatties. I check every day, haven’t found any more. They can be really hard to spot, they have fantastic camouflage. In the past, I had to pull them off the vines and squish them. Ick. Love handing them to a happy chicken for proper disposal. Speaking of chickens, John and I put golf balls in their next boxes. The girls should start laying any day now, and I want them to do it in the coop. Sweet Pea is very plump these days. And demanding. She pecks me hard. (I can’t get mad, she’s too cute!) I have begun to pet her every day; she flattens herself to the grass and clucks, but lets me rub her back. I think she is beginning to like the back rub. Clara Barton is tall and stately and red, and less approachable. She’ll eat out of my hand only after Sweet Pea gives her the okay. Snapdragon is wary, she gets close and watches, as though she really wants to be touched, but thinks I’ll grab her and so SOMETHING BAD. I think she should be a show bird. Her paint job is remarkable. Lucky for her, I am way to busy/lazy to enter a damn chicken in a beauty contest. Remember that perennial bed I planned to reclaim this summer? At last mention of it, I had cleared about 200 square feet of weeds and vines. Can’t even see that now, it’s more grown over than ever. The rain has made the poison ivy and blackberries very happy, they are forces to be reckoned with. I really don’t want to use poison, but… not sure one person can conquer this without some chemical assistance. Still thinking about it. Different subject: this is a photograph of the water rushing down our road. It roared! On the right side, it’s about 3-4′ deep, and it has never crossed the road in this spot over to the left side before. And it just keeps coming. We’ll be shoveling gravel this week, which means my arms will feel like rubber for a day or two. And we got another inch and a half of rain this afternoon. Next blog post: Building the Ark. Sweet Pea thinks you’re a rooster! That’s why she flattens herself let’s you rub her back. You’re a poor substitute, Sister, but I guess you’ll have to do! I absolutely can’t keep up with the weeds this year either. Hey, the sun’s coming out. Since it rained all night, the weeds should grow another six inches today! She’s in for a disappointment… although I’ll rub her back every day if she will LAY AN EGG.